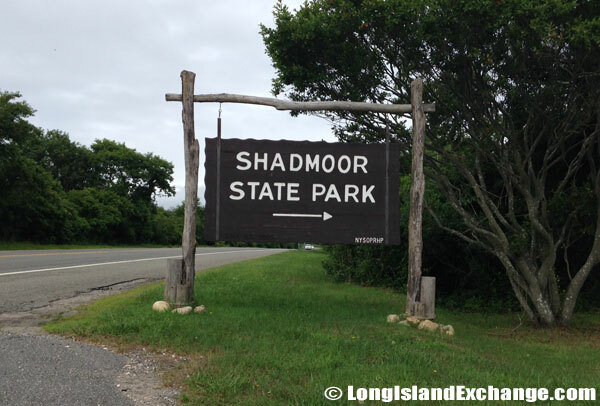 Shadmoor State Park is located in Montauk, New York, within Suffolk County, on the South Shore of Long Island. Directions: Route 27 (Sunrise Highway) east to Montauk Village. 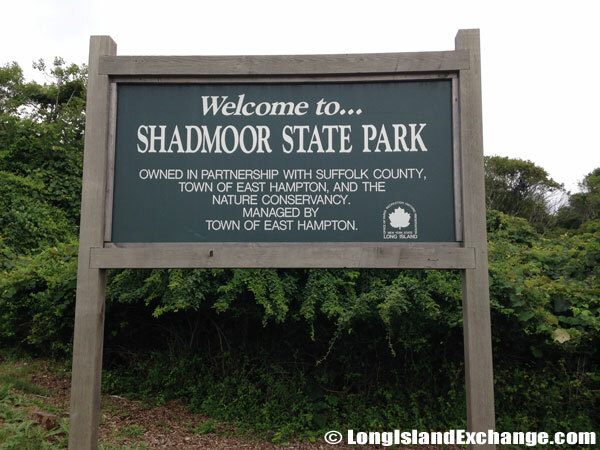 The park is one-half mile east of the village on the right, at the southwest corner of Route 27 and Seaside Ave.
A sign marks the entrance to Shadmoor State Park. 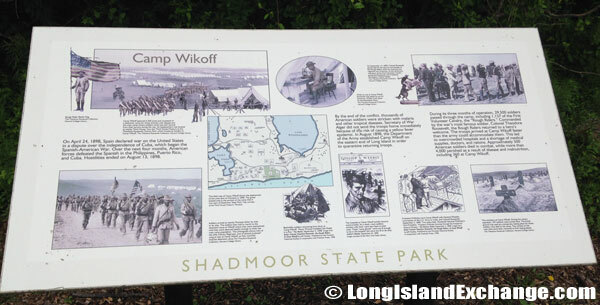 A sign details the parks shared ownership between New York State, Suffolk County, the Town of East Hampton and the Nature Conservatory. Overview: Enjoy a 99 acre park that features more than 2,400 feet of ocean beach accessed by two stairways. 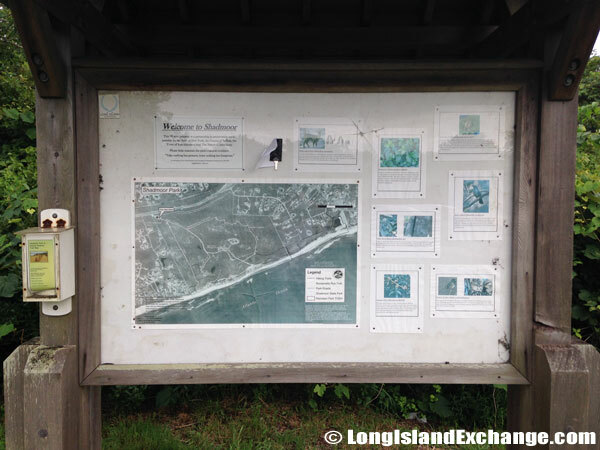 It was named for its open, rolling geography and the shadbush that grows there, also has bluffs, freshwater wetlands that are part of the preserve, hiking trails and elevated platforms for bird watching and enjoying the shoreline views. Vacationers can picnic and saltwater fish. The park’s flora includes black cherry trees and clusters of the rare and federally-endangered sand plain Gerardia plant. North America has the lion’s share of the world’s June berries, so the large bushes with 5-petalled white flowers and alternate leaves provide beautiful suggestions of where one must be, as the vegetation-literate scan the Shadmoor State Park landscape, draped in elegant abandon along a cameo of Long Island’s shore by the Atlantic. There are also two concrete World War II observation bunkers used for the New York coastal defenses in the park. 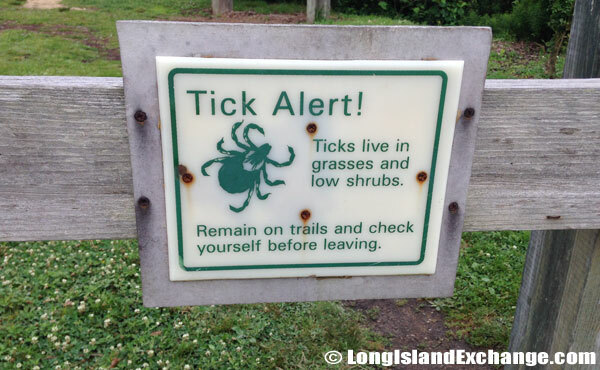 The area is home to ticks, this sign warns hikers and visitors. History: Shadmoor State Park was originally the site of two WWII artillery fire stations that were slated to be torn down. Then, the park was bought by New York State, Suffolk County, the Town of East Hampton and the Nature Conservatory. This was a unique sale that had all the partners looking to save the land from development. Previous to the purchase it was slated to be subdivided by four speculators with plans to build private homes. From 1977 till 1995 there were no properties named as new state parks. 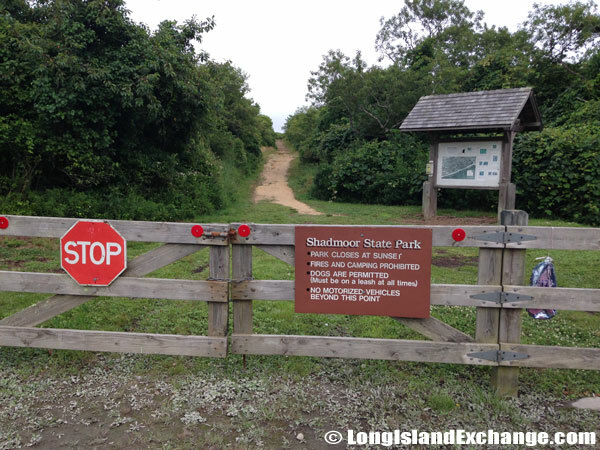 Fortunately, local Governor Pataki changed this pattern, and now has over five new state parks in the last few years. Two are in Montauk. A key hangs on this board with a note, found by a friendly visitor and hung here. Camp Wikoff was used to quarantine 29,000 soldiers including Theodore Roosevelt and the Rough Riders at the conclusion of the Spanish-American War to prevent the spread of yellow fever and other tropical diseases. Facilities: There are no facilities at all. It is just an ocean beach, freshwater wetlands, hiking and biking trails, in addition to 2 bunkers (designed to look like cottages from the water) built for surveillance during World War II. Seasons/Hours: Open year-round, seven days a week. Pets: Dogs only, on a leash not more than six feet long.